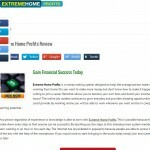 “Extreme Home Profits”, by Michelle Robinson and found at extremehomeprofit.com and -.net, is another link posting scam website created to swindle those who wish to work at home. The fictional character, Michelle Robinson, was also created to lure you in with her emotional story of how she became successful with Extreme Home Profits. The crooks that run sites just like Extreme Home Profits have been doing this a long time and know just how to manipulate newcomers who sadly land in their sticky web. Extreme Home Profits preys on those who are desperate to work online from home with internet marketing yet have no idea how to go about it. You have surely come across our Extreme Home Profits exposé looking for answers. I will break it down for you in a few easy steps. First, you should know that absolutely nothing on the Extreme Home Profits website is true in any way. If you go down to the bottom of their page you will even see that their lawyers drew up wording to refute the hype above. The reason Extreme Home Profits lies and gets away with it is because there aren’t enough government figures of authority to catch them all. That and as soon as scam watchdog sites like ours expose the sham, they soon after take them down and pop another one up on the internet. That is how Extreme Home Profits came to be. On the Extreme Home Profits site itself you will se many things that make it look like it would be something legitimate to try out but do not be fooled. We start with the news logos at the top. No one game Extreme Home Profits permission to use them and they even say so in their disclaimer. Next is the “only a few positions left” call to action trick making you think you are eligible for a job position which Extreme Home Profits should not really be legally allowed to offer. Next you see a bunch of stock generic photos that supposedly represent the fake working mom, Michelle Robinson and sometimes they change it up with another fake mom, Lauren Mitchell. The testimonials themselves are actually taken from old online home business scams previously pulled down by the FTC. The Extreme Home Profits scammers just don’t care. All that aside, you came here wanting to know if Extreme Home Profits works. I can undoubtedly tell you that it not only does not, but it’s on the internet for only one thing – to rip you off. Beginning with the join fee of $97, unless you try to exit the site and they keep discounting it every time down to $47, Extreme Home Profits also charges a monthly fee after. All that for substandard training and a whirlwind of junk offers by their third party scammers once you’re in the Extreme Home Profits “back office”. The real tragedy begins after you give Extreme Home Profits your credit card and personal info including your phone number. The Extreme Home Profits sales hounds will call you from the boiler room floor to get you to spend as much as tens of thousand of dollars for more inadequate coaching programs. Thousands of people have registered complaints online about how they got swindled by the scammers that run duplicate sites just like Extreme Home Profits. If all this has not scared you off from Extreme Home Profits yet then consider that many of the people who have complained also had to dispute extra chargers on their credit cards made without their authorization. Add to this the fact that there is no customer service or workable refund policy so don’t expect your money back – and cancel it in case you were unlucky enough to have joined Extreme Home Profits before you got the chance to read our exposé. There is nothing good about Extreme Home Profits, especially their subpar “training” and other scam products they peddle once you’re inside their site. Consider also that Extreme Home Profits will sell your vitals to third party peddlers who will flood your inbox and voice mail with a mountain of junk mail and messages trying to lure you into their scams. After all, they figure you were either dumb or unlucky enough to sign up with Extreme Home Profits so it’s open season on you. Do not get involved with Extreme Home Profits and ignore their ads in your email or however it is you came across this evil scam.